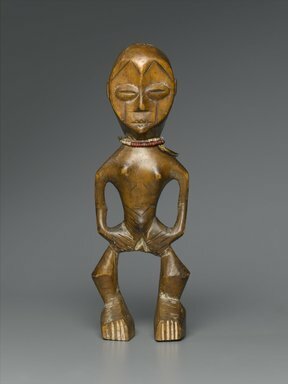 Female figure standing with legs apart and hands resting on hips. Around the neck are two necklaces, one of white beads and one of red beads. The face is heart shaped with triangular incisions at forehead. Eyes are almond shaped. There is a verticle incision on each cheek and incised lines on the lower torso. Knees bend outward. Block feet have vertical carvings for toes. Female genitalia indicated. CONDITION: Generally good. There is a check from top of left side of head in back that extends to waist. Gouge on top of head. Figure is attached to a modern metal stand.